Last year I got the baby in our office King Cake so I had to bring one this year on Fat Tuesday. Previous year's cakes have been dry and fairly tasteless so I vowed to bring one that was better - not too hard when your local grocery store was the place where the previous ones were procured. 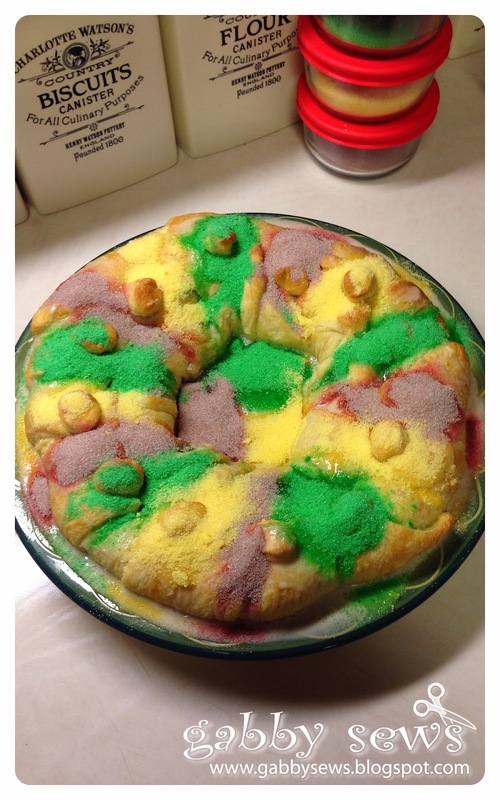 I searched on Pinterest for information and saw people making them from all sorts of base ingredients. I toyed with using The Pioneer Woman's cinnamon roll recipe to make one but in the end decided on a very simple one that uses refrigerated crescent rolls as the dough. 1 tsp vanilla - I use a really potent Mexican Vanilla that we bought on vacation so you might want to use a little bit more if you are using domestic vanilla. Mix first four ingredients together completely - I added the nuts after the first three were mixed well so I didn't completely destroy the pecans. Then take your crescent rolls and lay them out in a ring with the pointy ends facing out. (Sorry I didn't take any pictures of the process but here's a link to a picture on the web that I found so you know what it's supposed to look like: http://2.bp.blogspot.com/_cTOtC0h41SQ/Stpz-cHM7mI/AAAAAAAADyU/Ya2kbBEunQA/s1600-h/2009-10October+010.JPG) Then place your filling in a circle inside the ring and fold the crescent rolls around the filling. Bake at 350 for about 20-25 minutes. Once the cake is completely cool you will want to glaze the cake and then sprinkle it with colored sugar. I just used a simple glaze of powdered sugar with about 1/3 cup of milk - just add milk to your powdered sugar until you get a mixture that is the consistency you like. I like my glaze to be a little thicker so it doesn't just fall off. The traditional colors are green, yellow, and purple. I used just plain ole granulated sugar since that's all I had on hand and added a little bit of food coloring. The green and yellow were easy-peasy but the purple was really difficult and I never did get the color I was hoping for. You can also purchase pre-made sugars that would probably look better but I didn't plan that far ahead - I know, I know I had a year's notice of needing to bring the cake but somehow that just wasn't enough time for me! Everyone loved the cake but in the end I think PW's cinnamon roll recipe would have tasted loads better! Here's that recipe in case you don't already have it: http://thepioneerwoman.com/cooking/2007/06/cinammon_rolls_/ If you've never made them, go make them now! I'm convinced that this recipe is the reason all my neighbors stay home on Christmas so they don't miss my delivery! I think this cake would have worked by cutting PW's recipe by 75% and then instead of cutting the cinnamon rolls just forming the tube into a circle, letting it rise, and then baking it on a pizza stone.